Sorry mate I didn’t see you. I have never really got into the whole debate about the position and standing of cyclists on the road before now. On the roads I ride you simply can’t ride close to the curb. If I did I would either end up in a bush or tree or after being smashed by a stray branch end up in the middle of the road. I don’t much fancy eating tarmac and damaging the gear. Most of the time I have only encountered ” helpful” or drivers who respect by position on the road. Where possible I will try and wave cars through if I can see they can pass safely, especially I’d they have given me some space and time. There has also recently been the driver who doesn’t seem to care for other road users, not just cyclists but cars, pedestrians and others. This week I was out and I had the driver who passed me without much of a turn of the starring wheel. If I was any fatter I would have been the polish on the car. It was an expensive make an model too and my bike would have make a lovely scratch in the metallic paint work and my heavy body weight would have made the body very much less aerodynamic! Saying that the driver could have had the attitude of why are you in my way or just didn’t see me. Only they will know! The way forward is clear. Since riding a lot I have gained an appreciation of life as a cyclist, especially in the commute. All drivers should have to experience using the road outside of their vehicle, especially on a bike. This real life experience won’t solve every car v cyclist incident but if more drivers experienced the viewpoint from the cyclist it would help. On the flip side cyclists also need to not jump red lights etc and help vehicles out by not riding unresponsively. We need to have more people cycling to help the environment, save money in these financially difficult times, help with the health of the nation which are all personal benefits, but the state need to help out too. More cycle to work schemes need to be available, all future road plans in the UK need to include the viewpoint from the cyclist, car, lorry and bus etc. Only then we will start to get a system which work for everyone and not just the vehicles. If other countries can make the change I’m sure the UK can as well. Come on Government, take the road by the handlebars and make the UK the envy of the world for cycling and not just in sport on the track and in the Tour de France! This entry was posted in Uncategorized and tagged Cycling, other road users. When I started this blog I would be happy if I achieved a moving average speed of 25.0 kmph on rides. In fact riding before the blog started on the old bike 24 kmph was a target set by the very small peloton (just 2 people). It wasn’t long before this was achieved but it didn’t really move on from here. The new bike arrived with cleats (being clipped into the pedals) meaning I am able to put more power into the pedal, generating a higher wattage and as a result I am now achieving average speeds up around 28 kmph for my last three rides. These three have all been over a similar distance and terrain so I feel a good judge of my progress. It isn’t just down the the cleats, although they make a big difference, the stiffer frame of the bike helps control the power, but the engine is getting stronger too. My weight has come down slightly but my legs have changed shape and I feel more power from them. The work is slowly working and I am becoming healthier. Benefits will follow. Training for charity bike rides has certainly helped as this acts as a goal to aim at. As a result I am now looking on a regular basis for more sportives and rides to complete just to keep me going. The goal will be to complete tides with a decent time and then see if these can be improved in the future. The next step I thing is to really look at my diet. At the moment it is all to easy to snack on the crap and not really lose weight. According to the NHS chart for BMI I am just in the overweight category, not that this is a major problem, but as I get older I don’t want to remain in this “red zone”. The yellow one looks much better and as cycling goes yellow is the premier colour as we all know. To achieve this I either need to grow another few inches, which as an adult isn’t going to happen or control the weight. The second option it is then. More protein less fat and snacks. To help my quest I have increased the distance and frequency of the weekday rides but this is easy as I’m not working at the moment (summer holidays). Just need to remember the nights are starting to draw in so lights are required on evening rises. This is all good training and I will tackle another 65 mile charity ride in mid September. This will be the last one for this year but the appetite is there for 2014. I also think I need to adapt a training schedule to keep at a constant weight then step this up for rides and sportives. At the moment I am still in the 100 km area but an looking at increasing this into 2014. So what does 2014 hold. Depending upon dates the BHF London to Brighton bike ride again to achieve sub four hours, the possibility of the Dunwich Dynamo plus a number of local sportives and organised rides just as an excuse to get on the bike. I’d love to be able to complete a something 100 (a one hundred mile bike ride) and completing the Dunwich Dynamo would tick this box as its only about 190 km (120 miles). If you want to know why I refer to km for distances please check out rule #24. So I am well on my way in this additive world of cycling and pushing yourself in an attempt to lead a better life. I well an truly have the bug and I love it. Enjoy the rest of the summer and the rides you complete. As you know last weekend I completed the London to brighton night ride in 4 hours 38 minutes. When I crossed the start line at the weekend I was happy to have just beaten my fundrasing target of £250 so this job was done. This meant one part of the evening was a success and I just need to focus on the ride ahead. I always new there would be some people who wanted to wait until after I had completed the ride before they donated and this is to be expected. However I didn’t bank on the massive response from those who I work with, and have other involement with through youth football etc. I have to say it is very humbling. 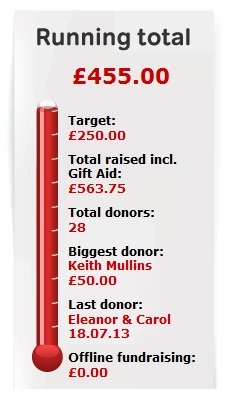 As the graphic shows I have well and truly smashed my fundrasing target and am now hoping I can climb over £500 doubleing my initial target. On the day the Tour de France has a double clim of Alpe D’Huez on stage 18 I am rather hoping I can achieve my own double, and reach £500. This entry was posted in Uncategorized and tagged Charity, charity bike ride, Cycling, fundraising, l2b, The British Heart Foundation. Some very good points to think about here. Froome should be in yellow if he keeps it going. The legs have recovered, although I still sleep like a baby, but again like last year I am now thinking about the next challenge. The third London to Brighton night ride is very much on as I still have unfinished business with this ride. Without light gate as mentioned in 4 hours 38 minutes (part 1) @GrabsNowBlog and I feel we can complete this ride in sub 4 hours. How to improve. Well as I am now a member of British Cycling as a ride member (£28 per year) this has given me access to the many Sportives which you can complete just to make the longer rides a bit more interesting. Obviously the normal Sunday morning cycle with friends will be a very important part of the training and development, if nothing else as a social tool and a chance to catch up after a busy week. The advantage of the Sportives is they don’t all require you to raise money which is a big ask of people to keep donating on a regular basis. @Grabsnowblog and I feel doing one charity event a year is enough and mine will be cycling, but he may run the London marathon if he gets his place. You’ll know as soon as I do and we can support him in his efforts. The British Heart Foundation already have registration open for the 2014 night ride on 12th July. The only reason I haven’t signed up yet is I am seeing who wants to join me as part of the team. I have alrwady had some requests from people on this years ride an others who have, in the past, completed London to brighton day ride but fancy having a crack at the night ride. If you want to join us on 12th July 2014 for the night ride then get in touch and I can start to organise the team. 2014 could be a big year. Both @GrabsNowBlog could be cycling London to Paris if we are successful in the ballot and this would definity become the main charity event, however there are other possibilities. I have always fancied completing the Dunwich Dynamo with is this weekend (but other commitments prevent me attempting this in 2013), and this could be an option. I suppose it depend upon the date and other events which could make the calander. I suppose, on reflection, this is one of the benefits of the 2012 Olympic games legacy. The number of people cycling has increased since the games and as a result this will start to have an impact on the health of the nation. This can only happen if we can actually make cycling an option for people to get about. Cycle lanes are required in ALL towns so we made the roads safer and we need to educate ALL road users. Cyclists need to respect vehicles and likewise the cars, busses, lorries and trucks need to think bicycle as well and think bike! Whatever I decide I will update the blog and comment on my progress. This entry was posted in Uncategorized and tagged challenge, charity bike ride, goals, l2b, Sportives, The British Heart Foundation. The second part of this story is just as important as the first, but for many different reasons. When you finish the London to Brighton bike ride you have to somehow get home. You can pay for a truck and bus service to transport you and your bike back to London, which is the only real option as the train companies won’t allow you to take your bike on the train. Alternatively you cycle back again and I’m not ready for this yet. The bus it is. The last morning bus leaves at 8am and this was not going to be a problem we decided upon the option of the afternoon service as this allows you to enjoy what Brighton has to offer, a beach and bars on a very hot summers day. Tired from the ride this was a good call. From part 1 you will know of the slightly annoying PA announcer who was only doing his job, but I know, but he managed to remind us of the 3pm bus service will be leaving at 3pm from the finish. It was near the finish, about 500 yards away and when we arrived at 2.45pm we joined the queue to get home, hoping it would be a quick journey as I just wanted to sleep. The bikes were loaded onto a lorry and we boarded the bus. Whilst this is not the exact bus, as I didn’t take a picture of it and for other reasons, it is good enough to set the scene. 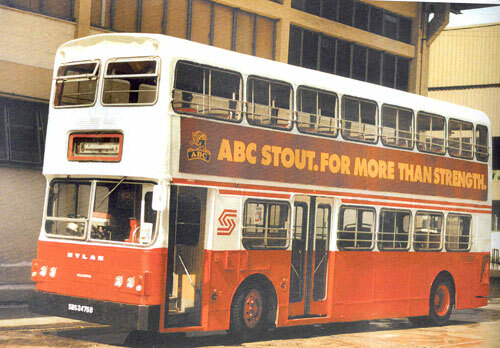 Remember Sunday afternoon was the hottest day of the year and back in the 1980’s when I assume the bus we used was built “air con” was just something you would find mentioned by Del Boy in Only Fools and Horses as a new Business venture he was getting involved with, or just a con which he had fallen for! As you can imagine the environment on the bus was about as warm as a volcano when it was erupting and the humidity was around 400%. Moist was an understatement. If I had shower gel I could have taken a shower right there on the seat. Anyway i was tired and the journey wouldn’t be too long so get some sleep and just get on with it. Oh the windows opened about as far as the Royal Mail will allow for a standard small letter today! We finally leave about 3.20 and the temperature drops to about 40C and I think I fall asleep. I wake up on the motorway in a long line of traffic somewhere Gatwick. Phone battery is running low and the same is occurring on @GrabsNowBlog mobile too. The driver did understand to a degree and eventually he did stop at a BP garage where we got some water and a large Twix, We had every window we could open except for the ones which had been screwed shut. The bus was obviously used on the school run during the week, so I can only assume they were screwed shut to stop the young people throwing things out from the upper deck. We were up stairs too, and I think it was marginally cooler here, but the margins were about the same as a bunch sprint in the tour when Cavendish won his last stage a few days ago – zero! At one point I turn to a fellow rider/passenger and say we need a hashtag for this experience. It now exists and is #stuckonaveryhotbus. If nothing else it should be used to unite those people who were together on “that bus” on “that afternoon” as we all shared “that horrible experience”. We arrive back at Clapham Common and then pile off the bus, much to the annoyance of the local road users (in cars) who after waiting about 1.1 micro seconds started on the horns to move the bus. The road was blocked with a bus one side and a lorry the other. At this point, however I couldn’t see their point. The bus did move when everyone got off. It was only a few minutes. The lorries also moved, and the annoying thing about this was they contained our bikes so it was another half an hour waiting for them to return, before we could cycle north across London to get the train home. At this point I think I had lost more weight on the journey back to London than on the ride itself. If only the journey had taken 4h 38 minutes. It certainly felt longer although in reality it was about 3 hours. Eventually the bikes were back in our possession and we started the ride back on the cycle lanes of London to the station north of the river. Luck would have it the train was there and we only had about a 5 minute wait. At last the final leg of the journey was here, well apart from the 3 miles cycle from the station to the house but that was the easy bit. I hope you have enjoyed both parts of the 4 hours 38 minute story which is just my reflection of the experience. I have no doubt edited bits as my memory struggles to remember them and have not been as close to the mark as I could have been. Although saying that the ride was excellent, the travel back was very mush a chore. This entry was posted in Uncategorized and tagged bike ride, hashtag, l2b, London to Brighton, stuckonaveryhotbus, Travel, truck and bus service. Does cycling cause impotence and sexual dysfunction in men? The answer to this question has received a lot of media attention over the past several years and has also been the topic of heated debate. The answer seems to be that prolonged cycling on a poorly fitting bicycle saddle may be associated with erectile dysfunction (ED), more commonly in older men. But the risk depends upon many factors including the hours of cycling per week, the weight of the cyclist, the skill of the cyclist and the bicycle fit.